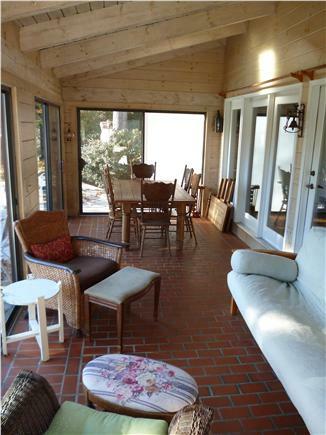 Three-Season Porch w/futon. Table seats ten. 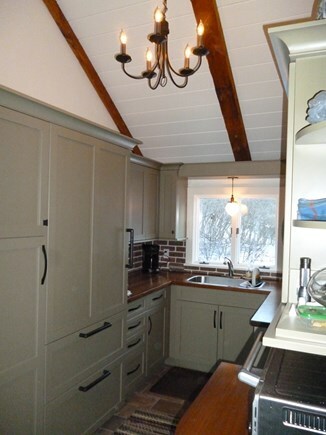 THIS PROPERTY IS A SUNDAY - SUNDAY RENTAL during the summer season (June 16, 2019 - Sept. 1, 2019). NO ON-CAPE BRIDGE TRAFFIC ON SUNDAYS. Just fly over the bridge and get on with your vacation. SPOTTY WIFI SIGNAL ISSUE HAS BEEN RESOLVED. Please note that this house is in a very quiet, rural area in which sound travels extensively making this property not good for loud partying. 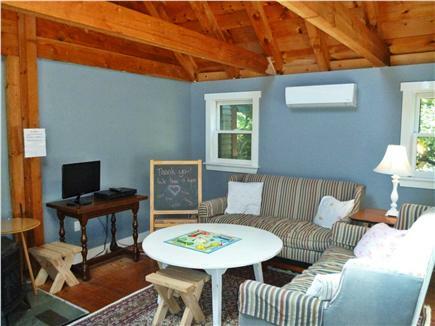 Best for families and groups seeking space, quiet, and privacy. Craigville Beach, 15 min. 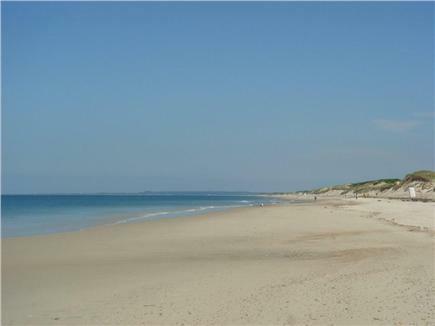 ; Sandy Neck, 10 min; Dowses Beach, 10 min. 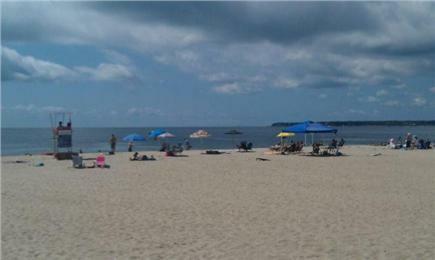 ; Kalmus Beach, 20 min. ; Loop Beach (great for small children), 10 min. Easy access to Rt. 6 for all-Cape exploration. A unique Cape Cod Vacation. 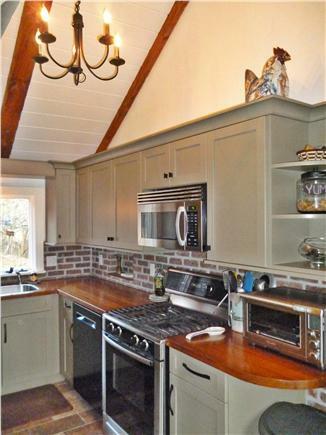 Located in the rural village of Marstons Mills, the house consists of outbuildings from an 1880 dairy farm, connected over the years to form a fun and unique house on 1.5 acres. House consists of two wings, each with a queen master suite with full bath. This is a great house for two families vacationing together due to the privacy the two wings allow. Two doors separate the wings, and kids think it's like a secret passageway. 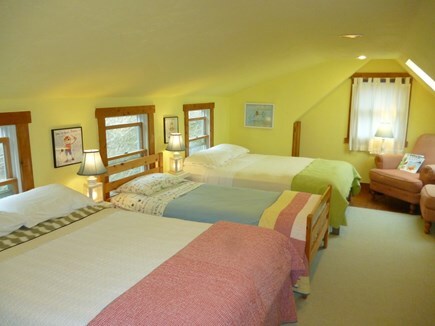 Children love their storybook-like room upstairs. After a hot day at the beach, come home to space and quiet. Escape the crowds and traffic and tourism of Cape Cod, but they're minutes away if you want them. 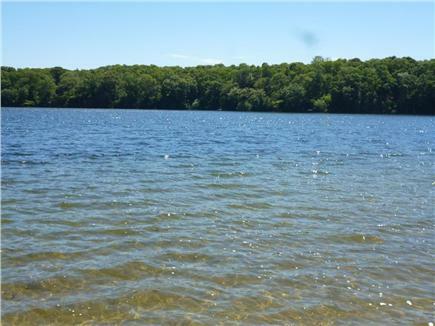 An enjoyable five-minute walk, or one-minute drive, will bring you to remote, sandy-bottom Long Pond, where you may well have the beach all to yourselves; where your young children can play in the water safely and where older kids can hang out together safely. You might want to bring the grill to the lake and have an evening cookout with swimming. Go for a run on the wooded trails, and bring FIdo along for the run and a swim, and to maybe retrieve sticks or a ball from the lake. Bring or get some apples and carrots to give to Cleo, Raven, and Romeo, the horses next door, or Girlfriend, Chloe (a huge draft), Nugget (a cute miniature), and Cheyenne behind the property. Take in the smell of fresh-cut hay as you have your morning coffee before hitting the beach. Town-owned conservation land extends from the property, with Long Pond at the other side of the pasture. There is also a paved road to the Long Pond association beach for hauling equipment (but the walk is fun!). Bring your kayaks and enjoy the serenity and beauty of any number of lakes and ponds in Marstons Mills. Launch yourself into the pond from one of the two rope swings out there. The Lake is for young children and is a wonderful alternative when it's too hot for the beach or when the tide is out. Children's games and books are provided, as is reading for adults. Bed linens and towels are all 100% cotton for comfort. House has three queen beds, one full bed, two twins, a toddler inflatable bed, an iBed cot, a Graco Pack-n-Play, and a futon on the porch. The queen mattresses are pristine, and both the mattresses and their box springs are encased to preserve cleanliness and prevent bed bugs. The furniture in the house is very comfortable and was selected with comfort in mind. There are two full baths and a 1/2 bath. Kitchen is fully outfitted. Dining room with seating for six; porch with very large table which seats ten comfortably; table with umbrella on deck which seats six comfortably; gas grill; charcoal grill; tree climbing; tetherball; croquet; bamboo for sword play; three fresh-water fishing poles to take over to the pond; tv can be moved to the porch; children's tv/dvd/game room is a great place for kids to crash and unwind after a hot day at the beach. There is a large walk-in outdoor hot/cold shower. 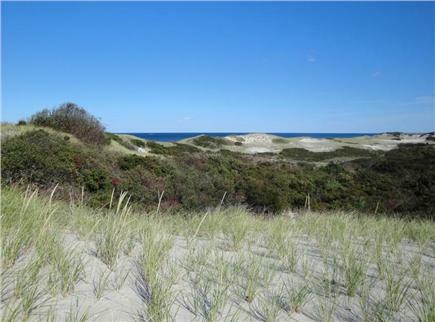 Enjoy homemade ice cream from a number of nearby shops; Go for a hike at Sandy Neck; roast marshmallows at a campfire at Sandy Neck Beach at night. 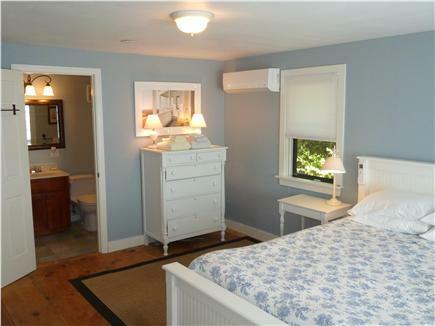 Beautiful W. Barnstable is right across the highway with its quaint shops. Mashpee Commons is right down the road. There are three cinemas nearby. There is room to park a boat on the property, which can be launched at Prince Cove in Marstons Mills. 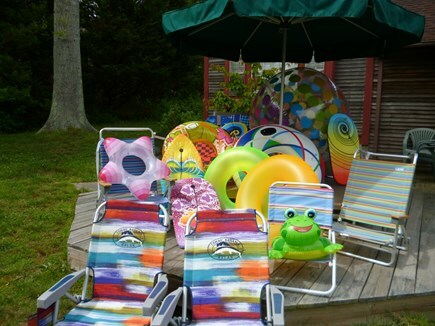 Owner provides a beach pass for all Barnstable beaches. The location of the farm is central on Cape Cod and not hampered by traffic, so Rt. 6 is easy to hop onto to get anywhere on the Cape. Hop on the Island Queen or Hy-Line or the Steamship Authority and take a day trip to Martha's Vineyard or Nantucket. Historic Sandwich is nearby. Check out the Heritage Museum and the Sandwich Glass Museum. Take a fun train ride through the Cape, leaving from either Hyannis, or W. Barnstable right across the highway - choose the scenic ride, family-supper ride, or another of their train rides; whale watch out of Millway Marina or Provincetown; deep sea fishing; pirate adventure; kayaking tours....Owner provides a binder with plenty of info. and suggestions for activities, directions to beaches and grocery stores, etc. No one is under foot as the house and grounds are spacious. Additional pricing info: Refundable Security Deposit $1000; dog(s) $140 per; cleaning fee $190 Summer;Lodging Tax: 14.45%, State and local taxes of 14.45% will apply. I am a homebody, and as such, it is important to me that my home be comfortable and a respite. I hope to provide the same for my guests. I respect and take seriously the fact that people will be spending a precious vacation week in my home, and I want it to be safe, clean, and comfortable. If I've been away for a day or longer, I love walking into the house. It is a sanctuary, private, quiet, surrounded by nature, from the property itself to the Town-protected pasture to the wood trails down to the lake. I like and hope to build a good rapport with my guests. 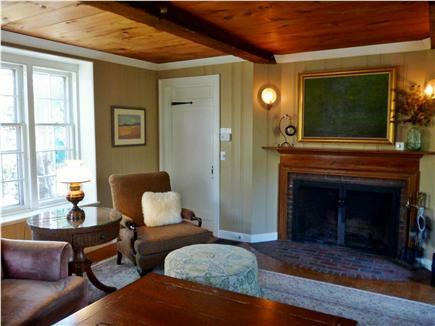 The house is very charming and is full of character. 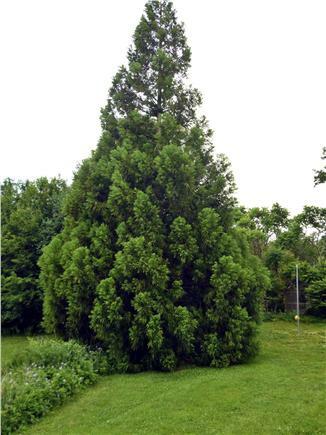 The grounds are beautiful, with a variety of beautiful trees, a lot of green, it is spacious and quite private. I love having the lake available for swimming, and the walk to the lake reminds me of overnight camp from my childhood, walking down a wooded trail with the smell of pines in the air. It is very quiet at night. While this is not a property for those who wish to step out onto the sand of a beach, it might be a good choice for those looking for an exploratory, whole-Cape vacation. 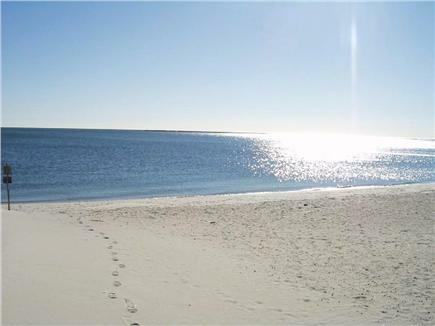 It is centrally located, and so all of Cape Cod is easily accessible, from the ferry to the islands to Plimoth Plantation to antiquing along 6A to going to the National Seashore or Ptown for a day, all are within easy reach of my home. I also love that there are no crowds at this lake or in the area, but the beaches and the hubbub of the Cape are a short drive away.